Do you ever have a craving for something very simple? I often do, and then I grill some vegetables. 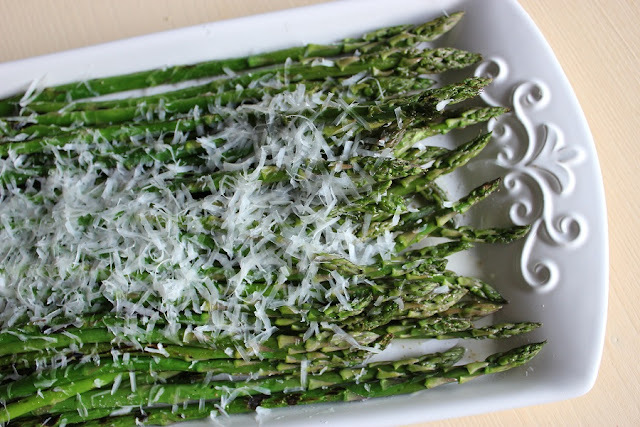 Today it was asparagus, that I grilled for about 2 minutes, sprinkled with lemon juice and herbs, and finished with a gated Pecorino cheese. Light, healthy and easy meal for a middle of the week. absolutely delicious dish, I so love roasted veggies. and about your question, ja, I have cravings ALL THE TIME, hehehe. Marina I have a special gift for you in my blog, please pass by my blog to pick it up. Thank you! That is such a nice award! When something is in season like asparagus, having it simply prepared is often the best way. I absolutely agree, when in season, vegetables taste so good that they need just a touch. Wow, so fast and easy. I'm excited to have asparagus so abundantly available and so reasonable at the market. And yes, you're right, sometimes the simpler, the better! When asparagus is in season, we like it just fresh clean raw. That's the first crunch of the season! Sometimes I don't even grill it, I can eat it fresh raw, crunch after crunch! Love to prepare asparagus this way; super tasty. Such a nice simple meal. Yes at times simple and healthy is something that we look forward to. I've tried it pickled, but never did it myself. I shell give it a try. Thanks for the idea. Asparagus are ever so tasty and surely grilling them must improve their taste even more. Delicious dish! Smoky flavor does it, doesn't it?! Simple yet delicious, very classy. Are those asparagus from your garden? Norma, you are so nice! No, it is not from my garden. Those two raised beds and a small 10x10 feet plot I can't even call "garden"...:) Plus 20 pots with tomatoes, more herbs, lemon, lime, kafir lime, peppers, flowers... Well, you've seen my Gardening Notes page. I would like to have some day my own asparagus though... and many other plants too! Isn't simple a new "black"?! :) Thanks for coming! Delicious! It looks so good! Thanks Jane! And it's gluten-free too! Oh yum! I love asparagus. The simple recipes are usually the best. This looks simply delicious! Agree, the simple often is the best. It brings the best in that vegetable. This picture is so beautiful! As is the plate - so simple and clean, plus the "recipe" sounds delicious! Great minds think alike...I often grill my asparagus in my grill pan, right on the stove. Love the way you made yours, Marina...delicious! Your dish looks so awesome and delicious!